Wow. This cheese was smelly, moldy:, and very sharp on the tongue. It is often unpasteurized, fromsheep's milk, and very very blue and crumbly. Whole Foods buys it for $30-$35 dollars a point from a regional importer. This is the cheese that is famous for maturing in the caves of the French countryside. I actually liked it a lot, more so than the Italian Gorgonzola we tried. I think that of the three blues I have tried so far (Stilton from Colston-Bassett in UK, Gorgonzola from Lombardy, and this Roquefort from Carles, France) this is my order of favorites: 1) Stilton, Colston Bassett creamery 2) Roquefort, Carles, France, 3) Gorgonzola, Lombardy, Italy. The Roquefort has a biting, 'blue' taste but the blueness is full and the background taste is creamy enough to complement the mold. Surprisingly, it even tasted a little sweet after a couple of minutes of the blue. The piece I had was overwhelming in taste (and sinus-clearing:) but that's sort of the nature of this cheese: it doesn't intend to supplement a flavor because, in medium-sized pieces, it IS the flavor! 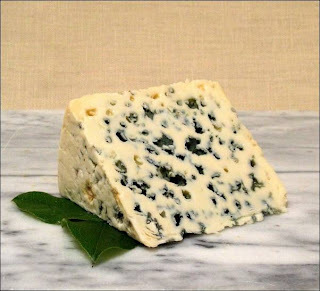 Having said that, I think Roquefort is fairly versatile, though, in small crumbles; I know I have seen it sprinkled over salads and as the main part of a pasta sauce, for example. Sharp, acrid, full tatse, moldy, excellent. roquefort was certainly bold and i can see why it has been describe as "the king" of cheeses. it was upwards of $30/lb at my boutique cheese shop. i preferred the gorgonzola to the roquefort, just because the gorgonzola was understated. roquefort was outspoken in every way. i actually think that if you pick an adjective you can wrangle roquefort into it. so it runs the gamut, but i think this confusion, although appealing, diminishes the cheese in my eyes. i prefer a cheese that does one thing really well. roquefort does many things adequately. if i were to wife a cheese, roquefort might well be the one, but the whole point of tasting is to get around. 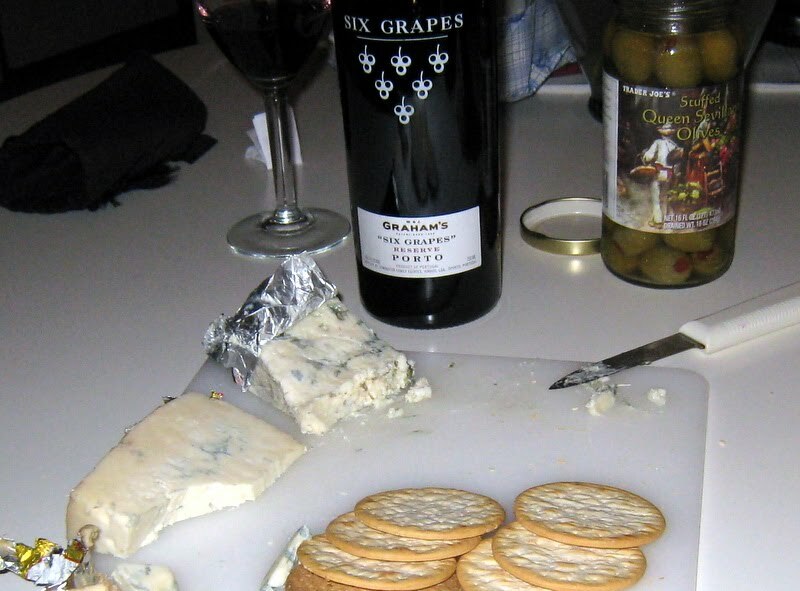 i say that for the cost, the gorgonzola or the stilton would be a better bet - and more interesting individually. Papillon Roquefort gets 6.5 slices. This cheese can indeed be like a high maintenance bride, in some settings (Gouda is on the money). One thing that Feta mentioned stood out on my Roquefort Carles as well: SALTINESS. Mine was so salty; it was like the cumulative experience of licking the hind leg of a smoked, salted pig while drinking large amounts of soy sauce. Anyway, I believe in cheese making, normally, that the curds are salted as the controlled spoilage begins so that the spoiling process can be slowed down and controlled. But is it for taste at all? Does anyone know the details about salt and making Roquefort? I'll preface the following comment with a statement of the (obvious) fact that I am a novice novice amateur. Perhaps this cheese was a little beyond my expertise, but I'm a texture person, and it was too slimy for me. And very salty. Perhaps it would have been better with bread to mellow it out a little. I too preferred the gorgonzola.... I felt it was more accessible. Hello to all blue cheese fans !...I have been looking for the taste and aesthetic criteria for the perfect blue to try to create in my bat cave. your thoughts to help create this new blue? ... For those of you that love the stuff...what is it that your ideal blue needs. Heres my take: Only slightly softer than a stilton (semi-dry), with a softer rind, no mushy cheese that can't stand on its own... creamy... melt in you mouth with a 3-5 second delay, without chalk or glue, salt that enhances but leaves your blood pressure alone... blue green travertine marble in appearance, tang like fresh pepper on an heirloom tomatoe, muted by sweetness, a nobel strength yet mixed with carmel. Nose like a fresh wild porchini and ...raw milk by capricorn herself.
? How can you compare Gorgonzola to Roquefort I don't see the point?